The day the Aina twins, born 12 weeks premature, were discharged from the hospital was a day of great celebration. Their loved ones had feared that the tiny girls would not live past a few days and were overjoyed to witness them transition to their home. Unfortunately, people’s fears were realized when the smaller twin, Modupe, contracted pneumonia just 3 weeks after being discharged, and died because their local primary health center did not have oxygen. The first few months of a child’s life are fraught with potentially life threatening health complications. In countries with struggling health systems like Nigeria, children are more susceptible to preventable diseases such as malaria, diarrhea and pneumonia. According to the The UN Inter-agency Group for Child Mortality Estimation, in 2017, Nigeria had the 6th highest child mortality rate of 100 deaths per 1,000 live births. Therefore, the chances of a Nigerian child dying before their 5th birthday is 1 in 10, a ratio that’s approximately 21 times the average of developed countries. Pneumonia, an infection that inflames the air sacs in the lungs and limits oxygen intake, is the highest killer of Nigerian children under 5. Low blood oxygen concentration, also known as Hypoxemia, is a major complication of pneumonia and is associated with increased risk of mortality. Low blood oxygen concentration results in the suffocation of the body’s cells, tissues and organs, preventing them from functioning properly. Oxygen is the primary treatment for hypoxemia and without it, organs fail and the patient dies. Hypoxemia is also an under recognized complication of non-respiratory illnesses such as malaria, another major childhood killer. Improved access to oxygen can reduce childhood pneumonia fatalities by 35%. In Nigeria where about 177,000 children die annually from pneumonia, at least 61,950 children can be saved annually by making oxygen readily available. We at LifeBank have spent the last 3 years discovering and delivering blood to hospitals on time and in the right condition, saving the lives of hundreds of children in the process. On this United Nations Universal Children’s Day, we are expanding our product suite to include oxygen, because we believe that no child should die from the lack of oxygen in hospitals and we are on a mission to make this the reality. 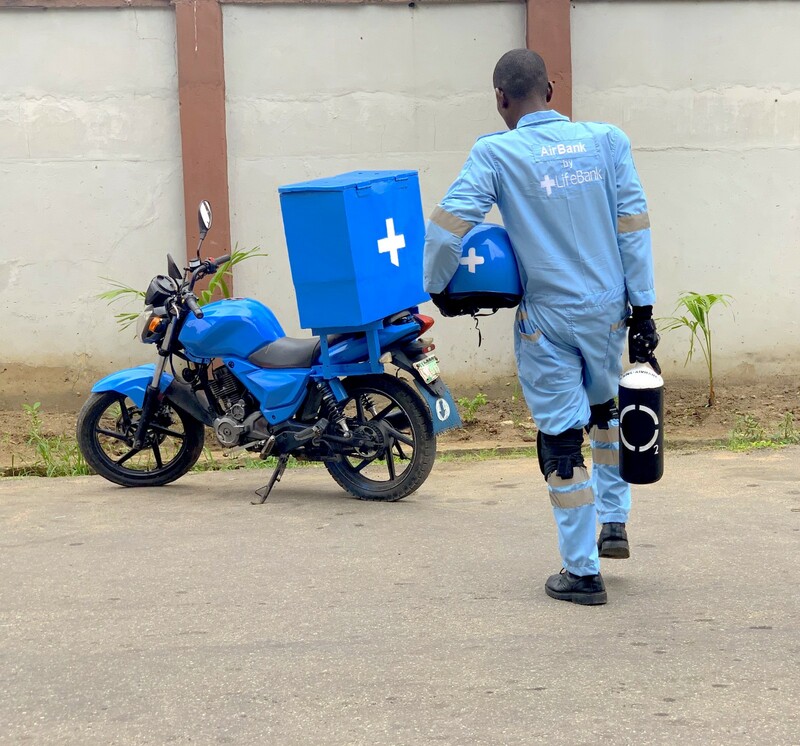 Our goal is that AirBank — our on-demand emergency medical oxygen delivery product that is the quickest, most convenient, and most cost effective way to order medical oxygen in cylinders — will reduce Nigeria’s child mortality rate caused by limited access to oxygen. Hospitals or patients can call LifeBank on +234 909 716 7238 at any time of the day to request emergency medical oxygen, and we will deliver in less than 50 minutes. We look forward to saving the lives of even more children by increasing access to another essential medical product. LifeBank is a medical distribution company that uses data, smart logistics and technology to discover and deliver essential medical products, saving lives in hospitals across Nigeria. LifeBank is currently working on the blood shortage problem in Nigeria by connecting hospitals to blood banks, and blood banks to donors. We connect donors through mobile infrastructure, and built a discovery platform where hospitals can request the blood they need. LifeBank delivers the blood requested in less than 45 minutes, in a WHO Blood Transfusion Safety compliant cold chain. We are also working on improving oxygen access across hospitals. We are in the business of saving lives!